This was as of January 23 at 10:55pm. Happy New 2018!! This year is going to be my favorite, I think. This is the year I get to marry my best friend for all eternity, have my own family (even if it’s just two of us for a while), move out of Salt Lake and in with a boy (WHAT?!?! ), graduate from college, and maybe get a grown up job… To me, all of this stuff is helping me become a “real adult.” So, I guess I could say that this is the year I become an actual real adult? Yes! Bring it on 2018!! Life has gotten super exciting. I mean, it’s always been exciting but this month has been crazy!! I’m still the only RA, I’m fulling invested in classes, and I’m commuting back and form SLC and Midvale (just a sneak peak of married life I guess). Seriously, life is nuts! 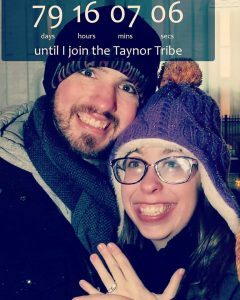 The days are counting down until I become a Taynor. We have date set!! April 13, 2018!! YAY! I think it’s funny how concerned people are that we’re getting married on Friday the 13th. It’s the day we picked. That’s the day that worked the best for our schedule. Plus, I’ve never had a bad experience on Friday the 13th’s. Haha. Planning a wedding is harder than I thought, though. There are so many things that have to be decided… I have the groom, the dress, and a temple. That’s all that matters, right? I’m so excited!! I can’t wait until I get to see his cute face when I wake up and not have to leave every night. Classes are good. I’m only taking 6 credits because I knew I was going to be busy with a wedding either during or right after the semester. It’s turned into a blessing because I have a big girl job now! What? Yeah!! As part of my RA job, I assist the housing coordinator with move ins at the beginning of every semester. Winter semester is pretty low key with move ins, so there’s not a lot to do. The three days was mostly me sitting in Veronica’s office talking. It was great fun. We talked about married life, wedding planning, and the future (specifically what my plan was when I’m not RA anymore). 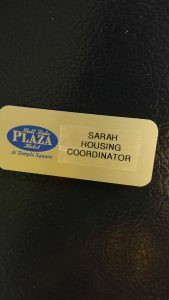 She asked me one day during one of our move ins conversations, “Hypothetically, would you want my job as the coordinator?” I legitimately laughed out loud, Then I actually thought about it. She then further explained that if Judy (the director) were to leave, she would get promoted and leave her job vacant. She told me that I am the person she’d want to take over as coordinator. We talked about it for a little while then she reassured me that it wouldn’t probability happen for at least 3-5 years. I told her that I’d talk to Richard about it and pray about this hypothetical situation. I went home and Richard told me to pursue it when the time came but because it was all hypothetical, I didn’t take it too seriously. About a week after that conversation, she called me into her office. I came down and she told me that she had been training to take over the director job and wanted to know if I had given her question any thought. I told her that I had but because it had been hypothetical, I didn’t think about it too seriously. She laughed and asked what I was thinking. I told her that it sounded like a great opportunity and that I would be willing to try. She then unofficially offered me the job – I still needed to meet with the general manager to make it official. About an hour after I had met with her, she texted me and asked if I was free to meet with her, Judy, and Mr. Workman in about another hour. I complied and quickly got professionally presentable. (I had assumed that she wanted to meet with me that morning about ra stuff so I was in a hoodie, jeans, no make up, and a beanie.) I threw on a skirt, quickly did my make up, and fixed my hair. I went downstairs and got called into the office. Because I was already an RA, I didn’t really need an official interview so this meeting was more of a friendly conversation about what was involved in the job and if I had any concerns or questions. To be honest, I felt really good about this job, my only concern was my housing situation. As an RA, I get free rent. As coordinator, I do not. 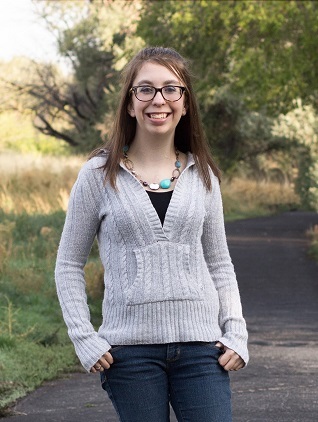 I had a three month limbo between now and when I move to Midvale. Since I haven’t had to pay rent for the last six months, I had used my money for food, school, and playing. I didn’t have enough to start paying rent. We were able to make out a deal that I continued to stay RA until I get married so that wouldn’t be a concern. Guys, I love my supervisors. They are all so amazing! So, now I’m doing both jobs. I’ve been training for the last couple weeks, but now I’m all on my own. Luckily, Veronica is just a phone call (or a floor) away if I have any questions or confusion (which is at least 50 times each shift…but I’m getting better and much more confident!) My schedule is only 20 hours a week and I can mold it around my class schedule. That will be so helpful when I don’t live upstairs anymore. I can come to Salt Lake for school and work and then go back home and not have to worry about leaving again! I still get to work (kinda) with these girls that I’ve been able to get to know through my RA job. I get to work closely with the RA’s and with Veronica still. I set my own hours. I have a paycheck. I’m loving this job so far. This job has been such a blessing. Definitely another way of how Heavenly Father is involved in our lives. Like not even a week before Veronica and I had had the “hypothetical” conversation, Richard and I were talking about me getting a part time job when we get married…until we don’t need to have me work anymore or until we have kids – whichever one comes first. Hehe. We had been trying to figure out if I would get a job in Midvale or try to work in Salt Lake when I have classes. It was a stressful thing to try and figure out. Thankfully the way the hours work with this job, I don’t have to worry. 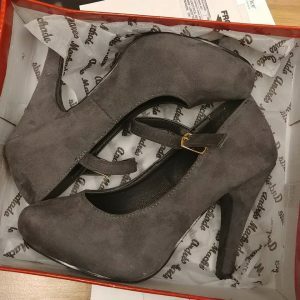 As my own personal celebration, I went and bought new shoes! My “new grown up shoes for my new grown up job” got here and I’ve been walking around in them on and off all week. Super cute. Super tall. Definitely going to take some time getting used to them. The feedback I got about them was pretty entertaining. Peoples commented “Nope. Pass.” “Super cute. Good luck wearing them.” “THESE ARE SO CUTE I AM ACTUALLY DYING!” “I need! !” “Very cute!” Lots of mixed reactions. Haha. I love them so much and look forward to trying to walk in them. I am so thankful for the hand of the Lord in my life. He guides us in the direction we should go, if we follow the Spirit and actually allow Him in our lives! I’m thankful for a loving and supportive sweetheart. I’m thankful for wonderful supervisors who want me to be my very best. I’m thankful for who I am as a person to have been able to be given this trust and responsibility!! Even though it’s not even sort of connected to my field of study, I’m so excited to see where this job takes me in the future. Girl, you probably don’t even remember me, but I’ve been following your blog for years now. I was a social work intern with Rainbow Kids the same semester you got your heart, and completely fell in love with your positive outlook and your quick smile. Even on the days when you clearly felt completely terrible you were super sweet and fun to be around! I spent a lot of time talking with your parents and you when you felt up to it those 4months before your transplant 🙂 You were crazy sick at the time though, so I don’t really expect you to remember it much! Point of this message is….. I’M SO HAPPY FOR YOU! I love that you’re growing up and getting a “real adult job” and getting married and all that other goodness. Seriously, it just warms my heart that everything has worked out the way it has. From seeing you the morning after your transplant to seeing these posts is just amazing. You are an outstanding person and I hope you know that! One day I hope to have as much faith and confidence and gratitude that you do. Until then, I’ll just keep blog stalking!! Just so excited for you!!! And rock those new shoes!! I love them! my daughter was married on Friday the 13th three years ago and it has been a great date for them as well. Best of luck as you move forward in life. I love following your blog.